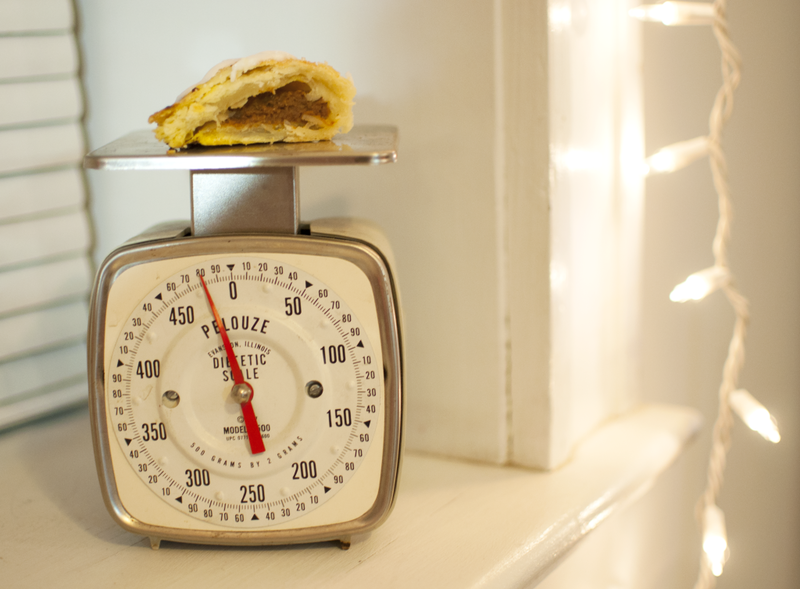 You are here: Home / puff pastry / [Small Batch] Pumpkin Turnovers. 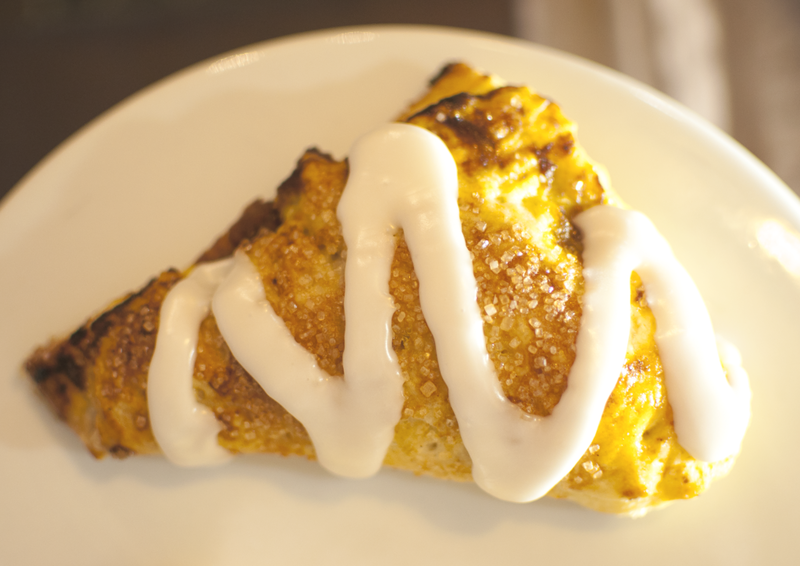 You’ve heard of apple turnovers, and chances are you’ve even heard of cherry turnovers. 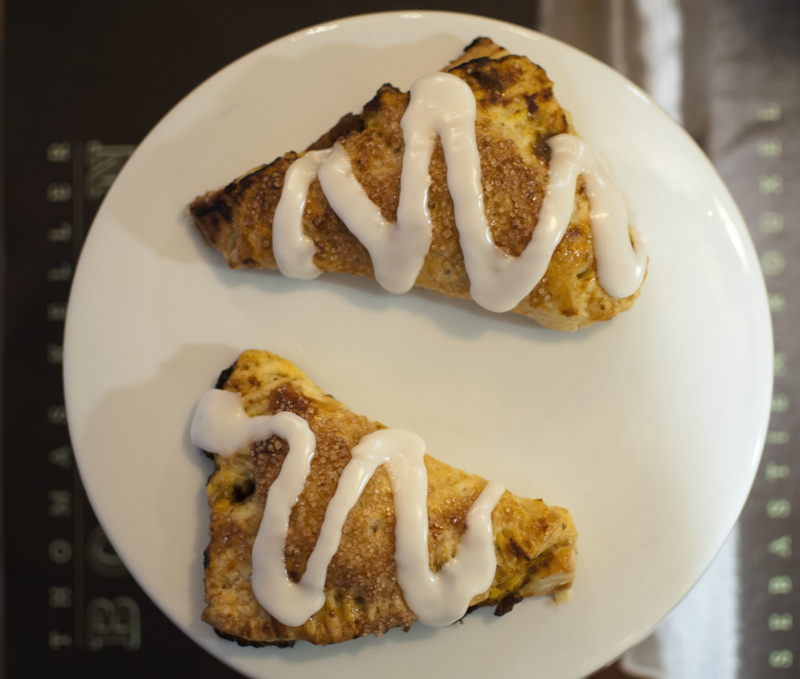 What about pumpkin turnovers? Probably not as common, but they do exist. The idea popped into my head a few weeks ago, after I first learned how to make small-batch, 30-minute puff pastry. I was always under the [very mistaken] assumption that making puff pastry was difficult and definitely not something I’d ever be able to conquer. That all changed a few weeks ago, when I took a class at Kitchen Conservatory with the Dessert for Two blog author, Christina. In the class, we made homemade apple turnovers, complete with homemade 30-minute puff pastry. I volunteered to help make the puff pastry, as I had never done it and I was obviously intrigued. 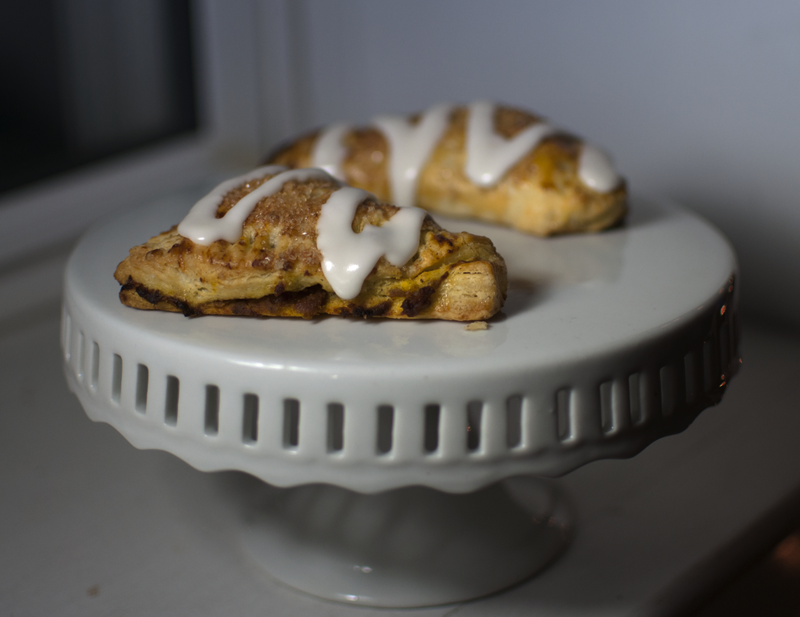 Immediately I was blown away by how easy it was, and perhaps more importantly, how delicious the turnovers tasted. Needless to say, I have been absolutely obsessed with quick puff pastry ever since that class. 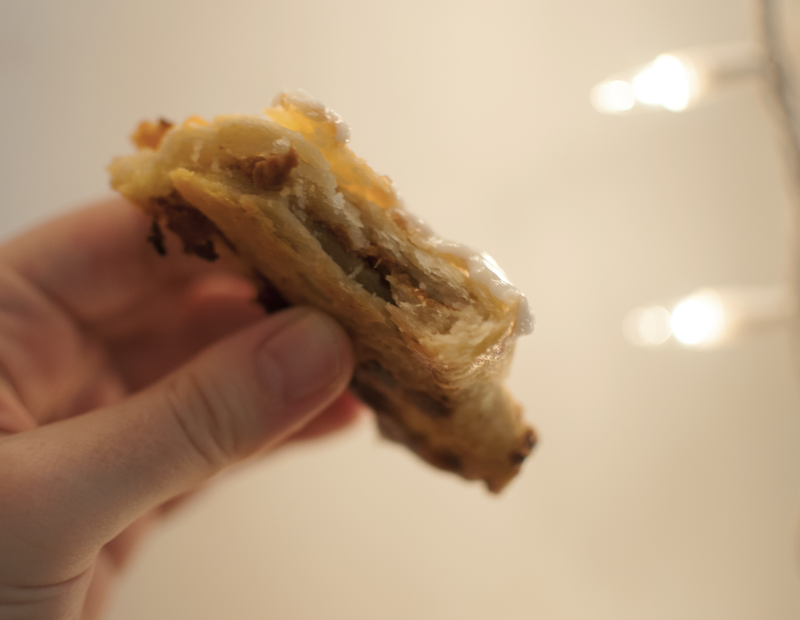 I have officially seen the light: puff pastry is the shiznit [as Snoop Dogg would say], and it’s really not that difficult to make! So, with all that to say, you know what to do. 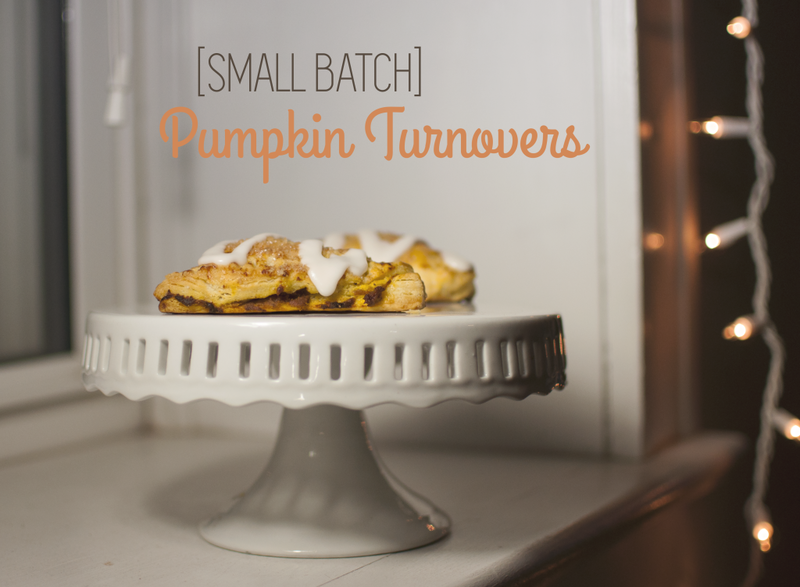 Make yourself some turnovers from scratch, and impress everyone with your amazing skillz. Prepare the puff pastry dough first (you’ll need to prepare it in advance, as it takes some time to chill): In a medium bowl, add the flour and salt. Stir to mix. Cube the butter and then add it to the flour bowl. Using a pastry blender or two knives, cut the butter into the dough. It will be very crumbly, and you’re done when the butter is in uniform pieces all about the size of peas. Next, make a hole in the center of the dough and pour in all of the water. Using a fork, stir to combine the dough. Flour a cutting board, and add the dough. Pat it into a rough square. You will still see chunks of butter and it will seem too dry, but do not add extra water. The dough will come together with each roll. Flour the rolling pin, and roll the dough out in front of you into a rectangle about 10″ long. No need to be too precise here. Fold the bottom third of the dough over the middle of the dough. Fold the upper third of the dough on top of the middle too. Rotate the dough one-quarter turn, and repeat. Use additional flour as needed to prevent the dough from sticking. Roll out, fold, and turn the dough at least 6 or 7 times. When done, wrap the dough in plastic wrap and chill for at least one hour, or overnight. Dough may be frozen, too. When you’re about ready to roll out the dough and bake, preheat your oven to 400 degrees F.
To make roll out and shape the turnovers: Roll out the chilled dough into a 12-inch square. Use flour as you go to prevent sticking. Divide the pumpkin mixture into four piles in the corners of the dough, but leave about ¾” of border. Cut the dough into four equal squares. Fold the edges of the dough over each of the pumpkin filling piles. You will have four triangular turnovers. Press the edges closed with your fingers (feel free to use a bit of the beaten egg as a “glue” to seal the turnovers closed), and crimp with the tines of a fork. Carefully transfer the turnovers to a baking sheet lined with parchment paper or a Silpat. Brush each turnover generously with the beaten egg yolk. Sprinkle with coarse sugar, if using. Bake the turnovers for about 20 minutes, or until golden brown and crunchy on the outside. Allow to cool for a bit on a cooling rack, then dig in! + 30-minute puff pastry recipe and original apple turnover recipe from Dessert for Two. + Pumpkin filling recipe from All Recipes. Welcome! I'm Darcie, and I am obsessed with baking. 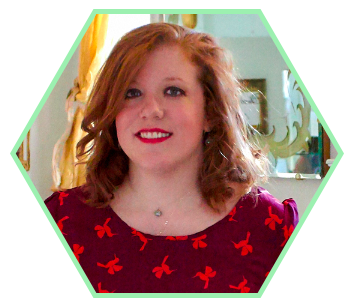 Learn more about me here. I'm slightly addicted to Pinterest. Copyright © 2015 Darcie Bakes. All Rights Reserved. Website designed by Darcie C., using the Beautiful Pro Theme. Proudly powered by the Genesis Framework.